To make room for an unprecedented number of participants, Compass will have to begin its 28th annual Pride parade half an hour earlier than usual. On March 30 and 31, Compass, the LGBT center of the Palm Beaches, will host Palm Beach Pride at Bryant Park in Lake Worth. The theme for this year is “50 Years of Pride,” which pays homage to the Stonewall uprising that sparked the modern LGBT rights movement. The event rings in 30,000 people annually, according to Compass, and is the oldest running Pride parade in Florida. For the first time during Pride, Compass is partnering with the Cultural Council of Palm Beach County to produce a unique art piece that will serve as the backdrop of Palm Beach Pride’s main stage. The winning entry was submitted by Rolando Chang Barrero, an artist from The Box Gallery in West Palm Beach, with more art sprinkled throughout the park. Pride is not just for adults — families are encouraged to participate. There will be an expanded family area called the “Youth Village” made possible by a collaboration with South Florida Family Pride. There will be a record-breaking 100 vendors present at Pride this year. According to Compass, they sold out of vendor space in February, which has never happened before. Free HIV testing will be available to all, thanks to a partnership with the AIDS Healthcare Foundation. The events kick off noon Saturday, and the parade begins Sunday promptly at 11 a.m. Activities end at 6 p.m. both days. The mile-long parade will be filled with local businesses, schools, organizations, nonprofits, elected officials, and feature an appearance from 2019’s Miss Palm Beach Pride, Kataleya Davenport Dupree. The entertainment for both days includes local performers like Charlotte Shottgun, Elite Drag Kings, Adelaide, Voices of Pride, and fashion innovator and rapper Roger That. DJ Citizen Jane will be entertaining the dance floor throughout the day while Palm Beach County royalty Melissa St. John and Rae Jean Cox will serve as the main stage’s masters of ceremonies. Sunday’s headliners include rap artist Cazwella, a gay man. He traveled to 15 U.S. cities benefiting the Human Rights Campaign, PFLAG, and The Matthew Shepard Foundation. Dancer Robin S. will also join as Sunday’s headliner. There will also be dogs available for adoption at the park over the weekend. This year’s Palm Beach Pride is made possible by its sponsors like PNC Bank, CAN Community Healthcare, ViiV Healthcare, longtime sponsor Wells Fargo, and more. 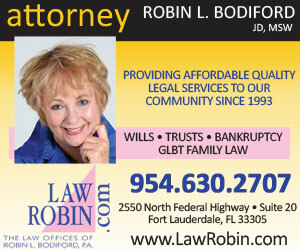 Palm Beach Pride is slated for March 30 and 31at John Bryant Park. Tickets, which are $8 in advance and $10 at the gate, are still on sale. For more information, visit Compass at CGLCC.com.